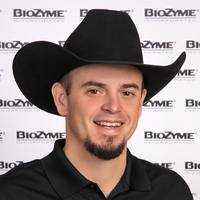 Sam Silvers, Junction, Texas, joined the BioZyme team in 2019 as the ASM in West Texas. He has an extensive background in the livestock industry, having raised sheep since he was 9-years-old. He and his family continue to successfully raise show lambs as well as commercial sheep and goats. He earned his master’s in ag science from Texas A&M, Kingsville. He received his bachelor’s from Texas Tech and also attended South Plains Community College, where he participated on the livestock judging team. Silvers has worked as a county extension agent, sold farm and ranch real estate and also sold livestock mortality insurance. He and his wife, Jurahee, have two children. In addition to spending time involved in the livestock industry and with his family, he enjoys hunting in his free time.